SAT Online Prep Courses Now Available! Classes are filling up fast. Make sure you register in time to get the class you are interested in. Thank You! CLASSES ARE FILLING UP, ENROLL TODAY!!! We are the first 911 Driving School Franchise in Ohio! 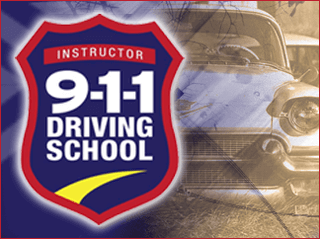 911 Driving School is the only driving school in Ohio taught exclusively by police officers! Trust the best to teach your student to be a responsible driver for life! Classes are now online. *Student must be enrolled and have taken a minimum of 2 hours of the online lessons to book a drive. Upon 2 hours completion of the online lessons, student must provide the school with the 2 hour completion certificate to be granted access to schedule drives. New! Ohio approved online driver’s education course, created by igottadrive.com . Course Includes both your enrollment and certificate of completion mailed to you. The course will take you on a virtual road trip across the U.S., see many great sites, and learn about driving from the experts at 911 Driving School. You will be well prepared to pass your Ohio BMV “knowledge test” and be on the road to being a safe driver. (Driving lessons may be scheduled once the student has completed 2 hours of online lessons. Please provide the school the 2 hour completion certificate to obtain access to drive scheduling). SAT Online Prep Courses Now Available through our Affiliate Program! An applicant for an initial driver's license, who is age 18 or older and who fails the first attempt at the maneuverability or road portion of the driving test, is required to take an abbreviated adult driver training course before attempting the driving test for a second time. Our course is a 4 hours behind the wheel training with a licensed instructor after online course is completed..
Our course is a 4- hour in-person class followed by 4 hours of behind the wheel training with a licensed instructor.